For many people, a walk-in bath is a major undertaking, representing a large financial expense as well as a big change in every day living. This is why, when it comes to choosing a walk-in bath or easy access shower, being able to visit a showroom displaying these items is important to ensuring you’re making the choice that is right for you. Understandably, what may look like a good idea in a picture might not be suitable in reality, especially as many people’s mobility is so variable. This is why our appointment only showroom in Henley on Thames, along with our mobile showroom that brings our products to you, has proved invaluable to our customers. A recent appointment in our showroom illustrated this point perfectly. A gentleman arrived to view our walk-in baths assisted by his two daughters. On arrival he was supported on each arm by his daughters. In discussion, we found out he had balance problems, was very unsteady on his feet and had fallen over in his bath tub in the last few weeks. Straight away our Advisor could tell a walk-in bath would not be suitable and a shower would be more appropriate and offered the relevant advice. However, the gentleman was very keen on a walk-in bath as he’d received two quotes already from large mobility bathroom firms who undertake expensive advertising in newspapers and magazines. Their sales representatives had convinced him a walk-in bath was the perfect solution for him, but his daughters were very unsure of this. On his insistence that he could easily access a walk-in bath, our Advisor demonstrated our Original walk-in bath in our showroom, before the gentleman then tried it for himself. His daughters had to provide assistance on each side and he had to hold on in many different places as he manoeuvred himself into the bath. It took a few minutes and was obviously uncomfortable and inconvenient. The discussion then turned to what might be appropriate and our Advisor demonstrated one of our two mock-up showers in the showroom. It sits in a right hand corner, has half height carer assisted shower screens, a shower seat and a support rail on one side of the door to aid with entering and exiting the shower. The shower unit is mounted on the right hand side of the enclosure so that it can be operated with the right hand when sitting in the seat and has a 60mm high step – a lot better than the 220mm on a walk-in bath. When the gentleman tried out the shower it made a huge difference. He could use it independently, holding the support rail and found the door wider and easier to access and exit. Getting into the shower seat independently also proved easy. Needless to say, a home appointment to quote for a shower was soon booked and the customer proceeded to place an order shortly after. This example illustrates the perils of buying a walk-in bath without trying one first, especially in cases where mobility is quite badly impaired. Beware salespeople who cannot show you a walk-in bath and let you try it out! For some people a shower is a much safer and easier to access solution than a walk-in bath and you should make every effort to verify which is more appropriate for you. 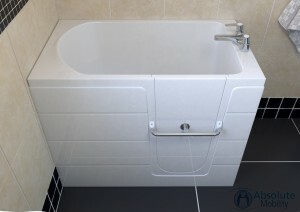 Absolute Mobility prefer to ensure you are guided toward the right bathing solution, be it a walk-in bath or a easy access shower, rather than persuading you to buy something unsuitable just to get a sale. To find out if a walk-in bath or shower is the right solution for you, or to book the Henley showroom or a home quotation with the mobile showroom, please get in touch with Absolute Mobility on 01491 411041.